High-tech metal alloys are widely used in important materials such as the cladding that protects the fuel inside a nuclear reactor. But even the best alloys degrade over time, victims of a reactor's high temperatures, radiation, and hydrogen-rich environment. Now, a team of MIT researchers has found a way of greatly reducing the damaging effects these metals suffer from exposure to hydrogen. The team's analysis focused on zirconium alloys, which are widely used in the nuclear industry, but the basic principles they found could apply to many metallic alloys used in other energy systems and infrastructure applications, the researchers say. The findings appear in the journal Physical Review Applied, in a paper by MIT Associate Professor Bilge Yildiz, postdoc Mostafa Youssef, and graduate student Ming Yang. Hydrogen, which is released when water molecules from a reactor's coolant break apart, can enter the metal and react with it. This leads to a reduction in the metal's ductility, or its ability to sustain a mechanical load before fracturing. That in turn can lead to premature cracking and failure. In nuclear power plants, "the mechanical integrity of that cladding is extremely important," Yildiz says, so finding ways to improve its longevity is a high priority. But it turns out that the initial entry of the hydrogen atoms into the metal depends crucially on the characteristics of a layer that forms on the metal's surface. While researchers have been studying hydrogen embrittlement for decades, Yildiz says, "almost all of the work has been on what happens to hydrogen inside the metal: What are the consequences, where does it go, how does it lead to embrittlement? And we learned a lot from those studies." But there had been very little work on how hydrogen gets inside in the first place, she says. How hydrogen can enter through this surface oxide layer, or how it can be discharged as a gas from that layer, has not been quantified. "If we know how it enters or how it can be discharged or ejected from the surface, that gives us the ability to predict surface modifications that can reduce the rate of entry," Yildiz says. Her team has found that it's possible to do just that, improving the barrier's ability to block incoming hydrogen, potentially by as much as a thousandfold. The hydrogen has to first dissolve in the oxide layer before penetrating into the bulk of the metal beneath. But the hydrogen's dissolution can be controlled by doping that layer—that is, by introducing atoms of another element or elements into it. The team found that the amount of hydrogen solubility in the oxide follows a valley-shaped curve, depending on the doping element's ability to introduce electrons into the oxide layer. "There is a certain type of doping element that minimizes hydrogen's ability to penetrate, whereas other doping elements can introduce a maximum amount of electrons in the oxide, and facilitate the ejection of hydrogen gas right at the surface of the oxide," says Mostafa. So being able to predict the dopants that belong to each type is the essential trick to making an effective barrier. 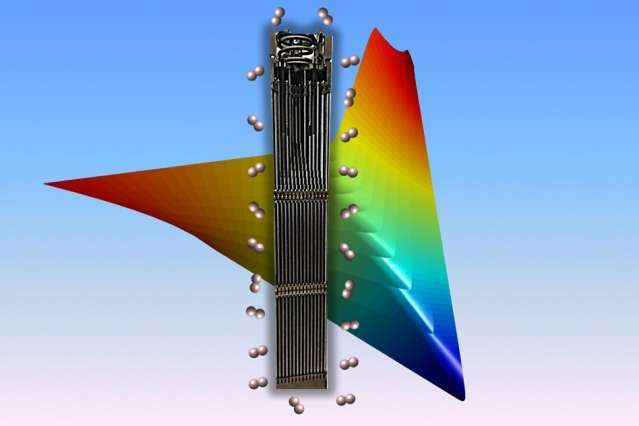 The team's findings suggest two potential strategies, one aimed at minimizing hydrogen penetration and one at maximizing the ejection of hydrogen atoms that do get in. The blocking strategy is "to target the bottom of the valley" by incorporating the right amount of an element, such as chromium, that produces this effect. The other strategy is based on different elements, including niobium, that propel hydrogen out of the oxide surface and protect the underlying zirconium alloy. "Any place you have metals exposed to high temperatures and water," Yildiz says—for example on equipment used in oil and gas extraction—is a potential situation where this work might be applicable. "The behavior of hydrogen has been cited by the commercial nuclear power community as perhaps the greatest challenge in nuclear reactor fuel performance under normal operating conditions, and more recently, as a safety issue under accident conditions," says Gary Was, a professor of sustainable energy, environmental, and earth systems engineering at the University of Michigan, who was not involved in this work. The approach to the problem taken by these researchers, he says, "is unique and intriguing but as important, it is the first attempt to provide a physics-based understanding of the behavior of hydrogen in zirconium alloys." While this paper doesn't yet answer all questions about this material, he says, "the approach taken by Yildez and her students raises discussion of this topic to a higher level, and will undoubtedly stimulate more research that is grounded in physics rather than empiricism."